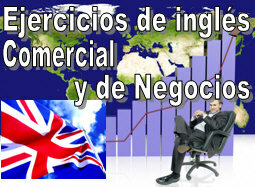 - En esta sección de EJERCICIOS DE INGLÉS COMERCIAL Y DE NEGOCIOS se encuentran recopilados y agrupados los ejercicios de Business English publicados en nuestros Cuadernos de Inglés para que tengas un acceso más organizado y sencillo a los mismos. Dado que mensualmente se distribuyen nuevos cuadernos, el material irá progresivamente incrementándose con con los nuevos ejercicios que vayan incorporándose. 1. They were one of our biggest competitors, but they - ? - broke the bank fell through the bank lost the bank went bankrupt last year. 2. Recent efforts - ? - to rise to shoot to go up to boost our company's visibility on social networks have been successful. 3. Our company is expanding rapidly. We have recently - ? - taken over taken in taken on taken for 6 new employees. 4. Before you launch a new product, you - ? - must to ought should might have do some market research. 5. Mergers and - ? - acquiring accumulations acquisitions additions (abbreviated M&A) is an aspect of corporate strategy. 6. I - ? - have been working had worked have worked worked at Cam Bank from 2001-2003. 1. I'd like to ask you something about the meeting tomorrow after work. Do I have to - ? - abscond attend assist ? 2. I was wondering if you'd mind - ? - giving awarding putting a little presentation at the meeting on Friday? 3. I'm afraid Mr. Garcia's not - ? - at on in under his desk at the moment, can I take a message? 4. Generally speaking, a good manager - ? - ensures makes sure is sure a smooth production process. 5. Pepito is - ? - very busy too busy too much busy preparing his presentation to come for a drink with us. 6. I'm afraid I can't meet you for lunch tomorrow, I have an important meeting - ? - I can't get time from I can't get away with I can't get out of (= I can't escape/I have to attend). 7. Everyone has to leave the office during a fire - ? - drill break rehearsal . 8. Make sure you - ? - follow up chat up brush up with Pepito about what we all discussed this morning. 1. I'll give you a ring - ? - immediately first thing firstly principally in the morning. 2. After you visualize and plan a project, you have to - ? - implement imply impulse impress it. 3. We need someone who knows how to use online advertising to - ? - gain drive get (= increase) online sales. 4. This unexpected price increase could - ? - set up mark down jeopardize (= endanger) the completion of this project. 5. When did John start working here? He was - ? - raised taken on put up fixed about two months ago. 6. In many offices, employees work in little areas called - ? - icicles cubicles cuticles . 8. There's no - ? - dress requirement dress code dress law in this office. You can wear whatever you like. 1. I went on a - ? - business trip work travel business travel to Paris last week, so I wasn't in the office. 2. A business' "core competency" is something that it can do well. It's something that - ? - has sets opens it apart from its competitors. 3. Pepito is always - ? - holding putting bringing the meeting up by being late. 4. He's got a really positive - ? - sense attitude look . He'll do well at this company. 5. As a guest at the company, we're going to ask you to wear this name - ? - patch tag label during your time in our factory. 6. Can we schedule a meeting for this Thursday afternoon? - Just let me check my - ? - diary bulletin compromises . 7. Marketing really dropped the - ? - glass bell ball on this one. How on earth could they have made such a huge mistake? 8. I'm afraid I can't take on any more work at the moment. I already have too much - ? - on my plate up my sleeve in the oven already. 1. Sydney, Australia is one of the easiest cities in the world to - ? - make up throw up set up a business. 2. Pepito, can you - ? - look up look through look down these documents and see if there's anything unusual in the terms and conditions. 3. Thanks for coming to this meeting everyone. What's on the - ? - diary notebook agenda for today? 4. I'm a little confused about the implementation plan for the new software. Could you - ? - walk me through it chase me through it demonstrate me through it ? 5. There are several reasons why I think this is a bad idea and I'm going to go through them - ? - little by little one by one time after time . 6. Pepito isn't a permanent employee, he's a/an - ? - temp part-time almost hired . 7. I have a terrible boss! She never gives me any positive - ? - cashback feedback payback on the work I do. It wouldn't hurt her to - ? - put charge pay me a compliment once in a while. 8. I won't be able to play golf tomorrow. I'm really - ? - rained on fogged up snowed under at work. 1. I don't think our department can start any new projects this month. We're totally - ? - swamped choked drowned with current projects. 2. I think Pepito should do the presentation. Social networking is his - ? - camp of expertise area of expertise space of knowledge . 3. We don't seem to have enough facts at our disposal in order to make an educated decision. I think you should - ? - make do take a little more research. 5. The new functionality will - ? - speed over speed for speed out speed up the checkout process in our online store. 6. I've always wanted to - ? - persuade chase pursue run after a career in web design. 7. No, I'm sorry I'm not - ? - taken about schooled with familiar with recognised on that company.